Formed in 2011, the Matt Ridley trio first appeared at the SE Collective at Amersham arms. 18 months later, the band return, augmented by celebrated composer and saxophonist Jason Yarde. The core of tonight’s band comprises the award-winning pianist John Turville, the highly musical (not to mention fiercely virtuosic) drumming talents of George Hart, with Ridley at the helm. The trio soars through the leaders' genre-bending improvisational territory with wit and aplomb, no matter if the musical terrain is tricksy or serene, creating a unique sound world unlike any working unit in London today. As a bassist, Ridley is solid to the core, yet light on his fingers across the fretboard as he navigates his own compositions using them as a vehicle for expression as a soloist, in which he succeeds greatly. Special guest saxophonist and globally recognized composer Jason Yarde perfectly assimilates the feeling of Ridley's compositions, singing the melodies from the depths of his soul, and improvising in a way that few saxophonists working in jazz could conceive. 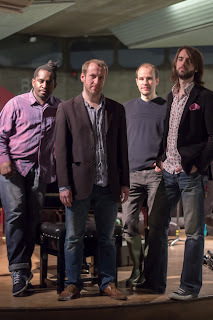 "Matt Ridley's trio project is full of spirited energy and clearly etched interplay, sometimes augmented by Jason Yarde on sax. Their music is certainly modern, yet appealing to older ears attuned to acoustic jazz and its long exploratory history. Matt's compositions take in counterpoint, odd metres, ethnic influences, and generally exult in the complexity of today's improvised music. This is clearly the work of someone eager and able to say something original in the jazz tradition. Incidentally, Matt has been a member of my UK quartet for six years." MATT RIDLEY PROFILE: Since graduating from Trinity College of Music in 2005, Matt has established himself as one of the leading young bassists on the UK jazz scene. Playing bass guitar at age 15, Ridley knew after a matter of months that music would be his career. After completing his A levels he went on to study at the Academy of Contemporary Music in Guildford, where he graduated with Distinction and was awarded the 'Bass Guitar Student of the Year' award, followed by studying for a Bmus (hons) in Jazz Studies at Trinity College of Music. Under the tutelage of Steve Watts and Corin Long, he began studying double bass and jazz in earnest, and graduated in 2005, winning the Trinity College of Music 'Friends in New York' award for excellence, and also garnering the Archer's Scholarship for big band. As of late, Ridley performs in all of Mike Garrick's many ensembles, including the 'Lyric Ensemble' with Nette Robinson, Nikki Iles and Tony Woods, The Michael Garrick Jazz Orchestra, and the 'MJQ Celebration', featuring Jim Hart, Barry Green and Steve Brown. He has also recorded and toured extensively with Darius Brubeck, son of jazz legend Dave Brubeck. Moreover, Matt enjoys success in other musical spheres, forging long-lasting musical partnerships with virtuoso oud player Attab Haddad, and BBC award-winning folk songsmith Sam Carter. He is a founder member of the SE London Jazz Collective.